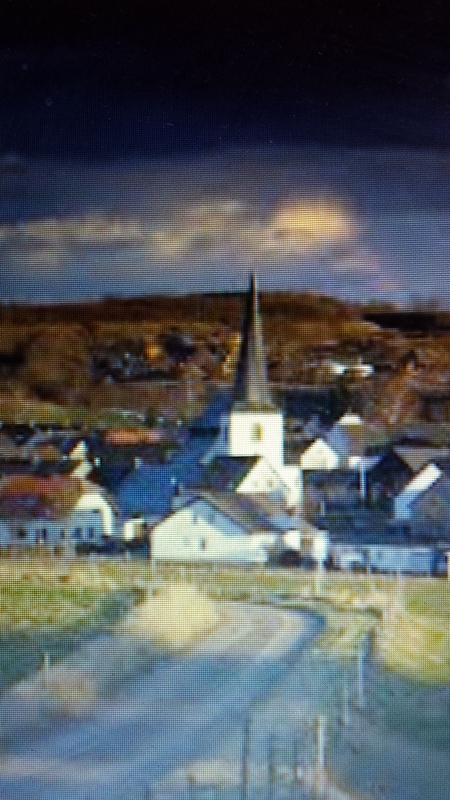 Pictured below is the village of Schalkenmehren. 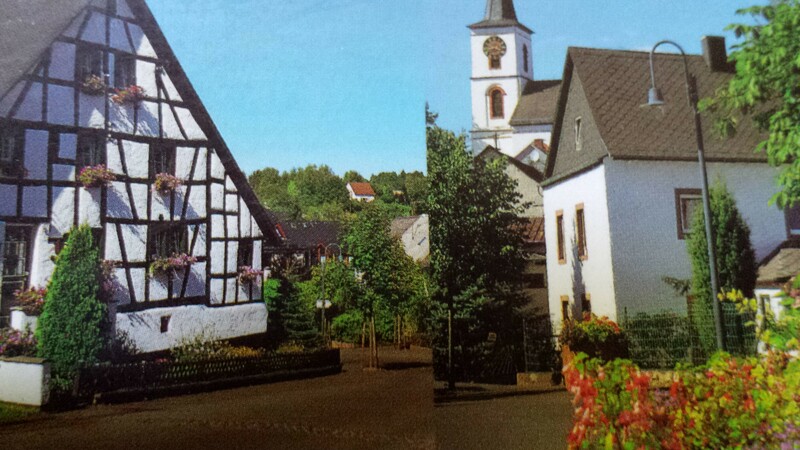 On a cold damp morning, in the year of 1813, church bells rang in the village of Schalkenmehren. The Uelmen family were burying Mathias Uelmen. Left behind was his widow, Sophia Schimplin and five children ranging in ages from 25-4. At Sophia’s side was my great-great grandfather, Johann Adam, a little boy of 7. The family followed four men carrying the body of Mathias. At the graveyard the bearers gently placed the covered body into a grave beside, Johann Adam’s older brother, Jacob, who had died three years earlier at the age of 15. A year later Johann Adam would stand in the same graveyard and say good-bye to his mother..
Who took on the task of caring for Johann Adam, his 5 year old brother and 10 year old sister? Most likely a relative, perhaps his maternal grandmother, an aunt, uncle or even his eldest sister who had married several months before. The other two siblings were probably old enough to fend for themselves.Life in Johann’s early years would have been tough. For many years there had been a series of poor harvests. The area wasn’t of a big interest to the warring countries on either side but troops their troops needing to winter somewhere often flooded in, increasing the burden of the area’s limited resources. Furthermore, the lack of roads prevented the trade of goods with bigger cities and the development of industry that might have provided jobs. Compounding these problems was the practice of willing the family property to all of a couple’s children. Parcels of land were divided and scattered making it difficult to have profitable farms. In 1816, 2 years following Johann’s mother’s death, the area endured what became known as the “year without a summer.” Volcanic dust caused by the volcano, Tambara lowered temperatures all over Western Europe and North America and created the worst famine of the 19th century. Food prices soared. Adding to the famine, troops returning home from the recently ended Napoleonic war, confiscated food to pay for the war. Villagers had to give as much as half of their crops as taxes not to mention the usual tithes, fees and rents. He may have lived and worked in the various villages that dot the area until he had made enough money to settle in the village of Strohn and marry Margaretha Lehnertz of Eckfeld in 1839. (Daughter of Peter Lehnetrz and Maria Barbara Schimtz.) Johann Adam Uelmen was 33 and she 27. Johann Adam and Margaretha had 6 children over the next 12 years – Katherina b. 1840, John Adam b. 1842, John Joseph b.1843, Nicholas b. 1845, Anna Gertrude b. 1847 and Peter b. 1852. All but John Joseph would lived to adult hood. Below is a photo of Strohn today. It looks like a nice quiet place to live or visit doesn’t it? So why did the family leave? By 1838 the land in this area had had been divided among heirs for so many generations that the farms had become too small to be viable. In addition the villages of this region had changed from growing crops like spelt and oats to a reliance on root vegetables, primarily potato. Ireland was not the only place to suffer from potato blight. Also changes in industry and the lack of roads made it difficult to make a living in other ways. By the time of Johann Adam Uelmen’s marriage chain migration from this area had already begun. As family and friends moved away they sent back letters and information encouraging other to come and join them. In July of 1844, five years after Johann Adam’s marriage, his older brother, Mathias emigrated to to Wisconsin. In 1851 Margaretha ‘s brother went followed by another brother of Johann’s in 1852. Before long they they were followed by two more sisters. By1857, the year Johann Adam and his wife left, the couple had 5 siblings living in WI. With little hope for their children’s future is it any wonder they chose to join their family and friends in WI? Johann Adam’s family, including my great-grandfather Peter- age 5, arrived in N.Y. on July 2, 1857 aboard the ship “Yorktown” from London. Their voyage would have been similar to the one the Meyer family took. Once in New York they would would have started west by way of the Albany and Buffalo Canals. Then by boat through the great Lakes to somewhere near Milwaukee or Sheboygan. Perhaps they were met by family, perhaps not. Either way, they then made their way by foot or wagon to St. Michael’s, WA county, WI. Joanne Adam was said to have brought grape plants for making wine with him. The climate of WI did not suit them and they died. Johann Adam too, died less than 3 years later in April of 1860. He is supposedly buried in the cemetery of St. Michaels’ catholic church. No grave stone now remains. A flood in the early 1920’s may have destroyed it. Why did so many people of the Vulkaneifel region area of Germany choose to come come to WI instead of elsewhere? I can’t say for sure but I do know the state of WI took an active role in encouraging immigrants to choose their state. Those coming from the Vulkanefiel region mostly settled in area of Fond Du Lac County, WI or Lorraine, Ohio. In some cases entire villages disbanded and went to America. By the time this chain migration ended over half the population of the area had left. Only Ireland’s mass emigration during the potato famine was larger. My next posting will be one of the sort of letters that likely influenced the Uelmen family to abandon a homeland they’d loved for generations for a new place called America. This entry was posted in Uncategorized on August 28, 2014 by kwriter13. I would love to communicate with you. Where could I send the information, too? It would be wonderful to have some photos of the area and more of it’s history. Especially what were the conditions like in the 1840- 1860 that compelled so many families to leave. What would their life there been like? What records,if any, would be available besides the church records which I have? And I wonder if any extended family still live in the area. What a great series of posts! My mother was Margaret Barbara Uelmen, daughter of Adam Uelmen. I’ve been doing research on the family for many years and your blog really makes the family members come alive! !